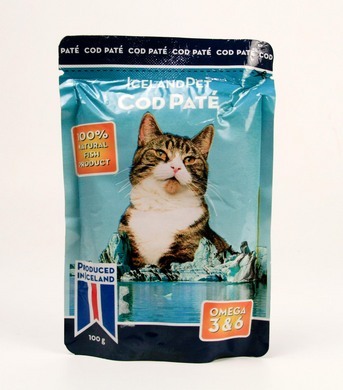 Cooked Salmon Paté packed in 100g pouches. 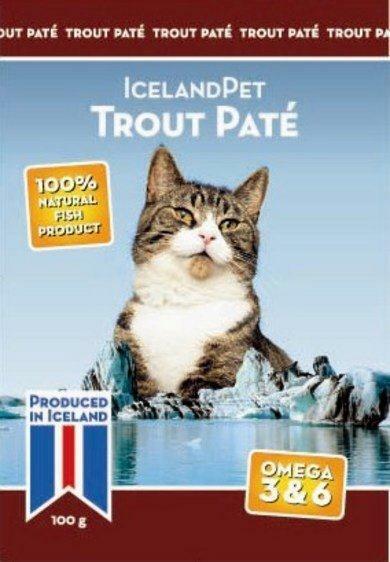 Rich in Omega -3 fatty acids and high quality fish protein. Raw material is brought from fishprocessors in the area close to our factory, the material is transported in closed plastic containers and in closed trucks and enters directly into the processing. At reception the raw material is evaluated and the temperature measured. The material judged to old or otherwise disqualified is sent away. The material is examined for foreign objects. The material goes through grinder. The materila goes through micro cutter and is fine grinded. The material is blended and other material mixed in. The material is put into the pouches. All pouches are cheked if leaking or defected. 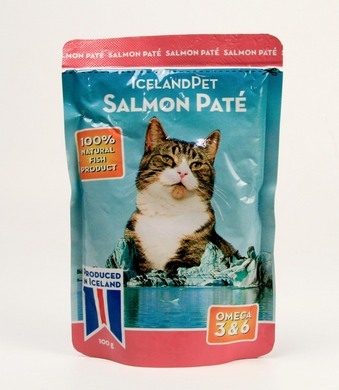 The pouches are cooked at 119 degrees Celcius for 95 minutes for 100g pouches and 120 minutes for 300g pouches. After cooking the pouches are put into boxes 10-24 in each and each pouch is checked. The batch numer, production date and expiration date is printed on the pouches. After the production the product is stored in a cool dry place awaiting shipment. Stock is regulary inspected. At shipment the boxes are stacked on approved pallets, plastic wrapped and marked.